LiveCode LessonsData GridLiveCode Data Grid Using The Built-In Field EditorHow Can I Customize The Field Editor Behavior? By default the Data Grid field editor allows users to enter data and save it back to the Data Grid. If you need data entry to behave differently you can assign your own behavior script to the field editor before it opens. This lesson will show you how. 1) Create a button to hold the behavior script you want to use with the Data Grid field editor. I've placed this button on the same card as the data grid. 2) Set the script of your button to the script of the behavior of button "Field Editor" of stack "revDataGridLibrary". This is the behavior script that Data Grid uses by default and is a good place to start when customizing the behavior. set the script of button "Custom Field Editor Behavior" to the script of the behavior of button "Field Editor" of stack "revDataGridLibrary"
Make any customizations you need to make. Whenever the Data Grid displays the field editor (e.g. the user double-clicks on a cell in a table) a preOpenFieldEditor message is sent the Data Grid. The first parameter is a reference to the field editor control. This is where you can assign your behavior script to the field. Prev: How Do I Save Changes The User Makes In An Editor Field To An External Data Source? Next: What Sorts of Things Should I Not Do In Order To Avoid Needless Suffering? This caused me problems as initially I had my behavior button stored first on the column template and then on a group that the datagrid was part of. 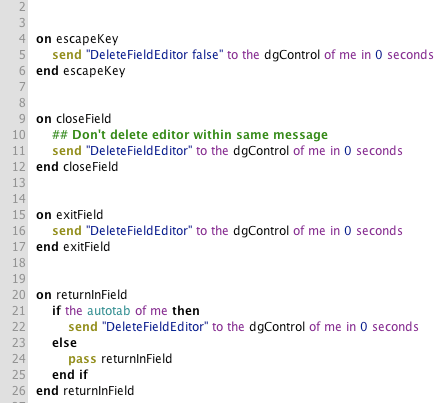 In these locations the preopenfieldeditor script failed to find the behavior button which results in a "silent" failure where the datagrid stops allowing cell editing. This failure was corrected by entering the full long ID of the behavior button which restored cell editing but my behavior code was still not being called. It was only called when I placed the button on the parent card/stack. set the script of btn "my custom field editor thingie" to the script of btn "Field Editor" of stack "revDataGridLibrary"
set the script of btn "my custom field editor thingie" to the script of the behavior of button "Field Editor" of stack "revDataGridLibrary"
Thanks for brining that to our attention, I have updated the lesson with the correction.